Beautiful flowers on glossy evergreen foliage. And a little invasive to boot! “Beauty is in the eye of the beholder,” so the saying goes. I would hazard a guess that invasive could also be substituted in that same sentence. Both apply to Vinca. It is extremely beautiful, and also – if in the right spot – can be invasive. But don’t let that deter you. If you have a spot that needs a flowering, low maintenance ground cover, this may be just the plant for you. Vinca major, also known as Bigleaf Periwinkle, Large Periwinkle, Greater Periwinkle and Blue Periwinkle, is an herbaceous perennial. That usually means they die back to ground level in winter and have non-woody stems. 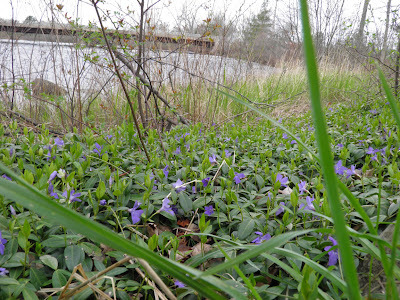 Vinca keeps its leaves throughout the winter, at least in Nova Scotia. Hence it’s also an evergreen. Vinca is a vine that spreads by rooting along its stems (hence the invasive part) and can form dense (glorious) mats of green with blue flowers on its surface. The plants themselves can grow to be a couple metres (4-6’) in spread. The leaves are deep green and glossy. Sounds pretty nice so far, doesn’t it. 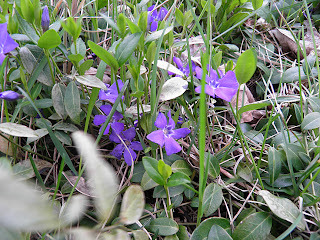 But it gets better The flowers themselves are violet-blue and about 5 cm (1”) across. These are held above the leaf mass by short stems and are not hidden in the foliage. 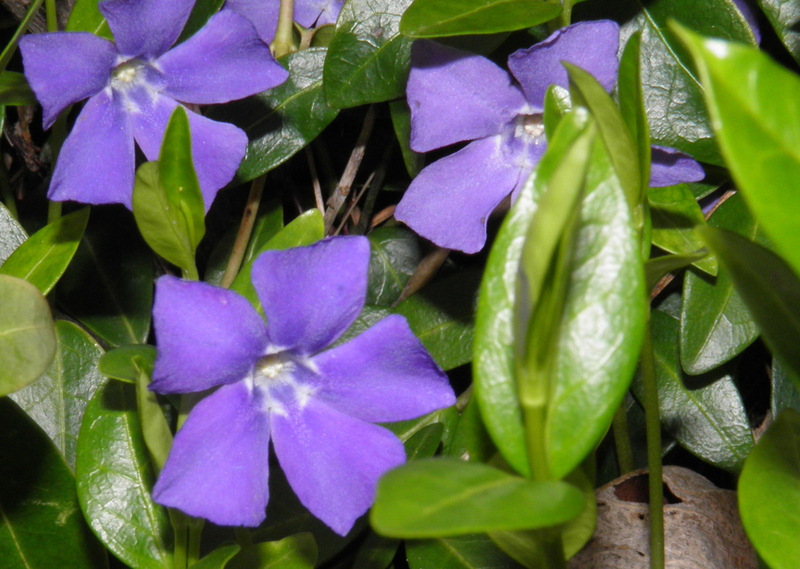 Besides being green for 12 months of the year, Vinca also blooms from early spring through to autumn. What’s not to love? The plant name most likely comes from the Latin word vincire, meaning bind, because the long creeping vines were used to wrap garlands together. There are two subspecies, each occuring in separate spots in nature. Vinca major subsp. major is native to southern Europe. Its distribution includes Spain and southern France east to the Balkans. Vinca major subsp. hirsuta has a more eastern range of the Caucasus in Turkey. Both species have now been cultivated in similar regions around the globe. There is a close relative, Vinca minor, that is very similar and a little "tamer" than the potentially rampant Vinca major. As with most plants, Vinca major has uses that extend beyond the garden. I haven't been able to find any direct recipes for consumption, but have rounded up a little information on medicinal uses. Two major active chemicals in Vinca major are vincamine (an alkaloid) and reserpine (known to reduce high blood pressure. Alkaloids are commonly used in the pharmaceutical industry to make many different medications. Local anesthetics, morphine and the anti-malarial drug quinine are all alkaloid medicines, along with Vinca major. Reserpine ointment can ease inflammation of the skin. 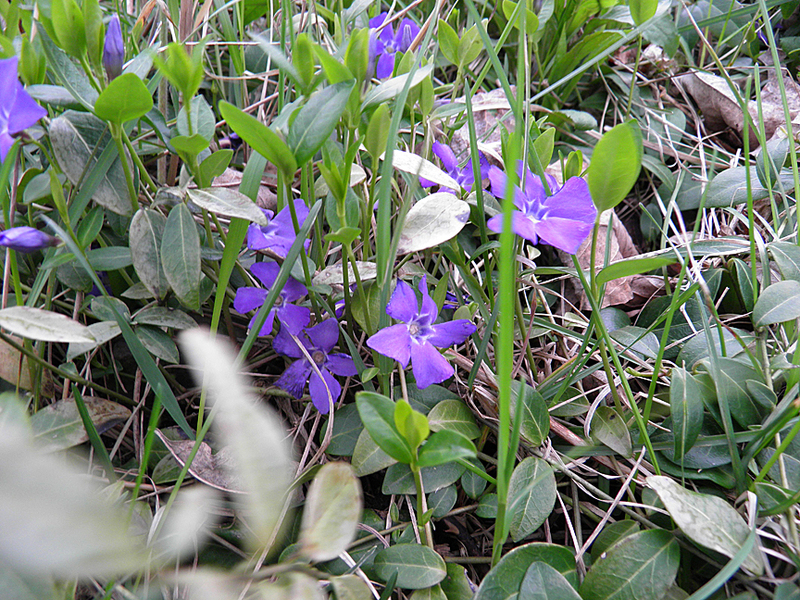 Vinca major is poisonous in large quantities. I would suggest it is unwise to go out picking to try to make your own medicine anyway. So don't do it. happily taken up residence on the river bank. This spot covers about 20' (7 m) along the shore. Vinca major prefers a moist location, often happy as undergrowth. It is very useful groundcover for woodlands and banks along the rivers. That’s where it is growing where I found it. It likes both full sun and deep shade. Vinca is available at gardens centres. It is considered a threat to riparian environments in some places in the United Sates. I LOVE that word – "riparian." It means "of the river bank". Is anyone out there familiar with the old British comedy series called "Keeping Up Appearances"? Hyacinth Bucket (pronounced "Bouquet"...) was having a riverside picnic and in her ever increasingly overblown description she used the pretentious term. 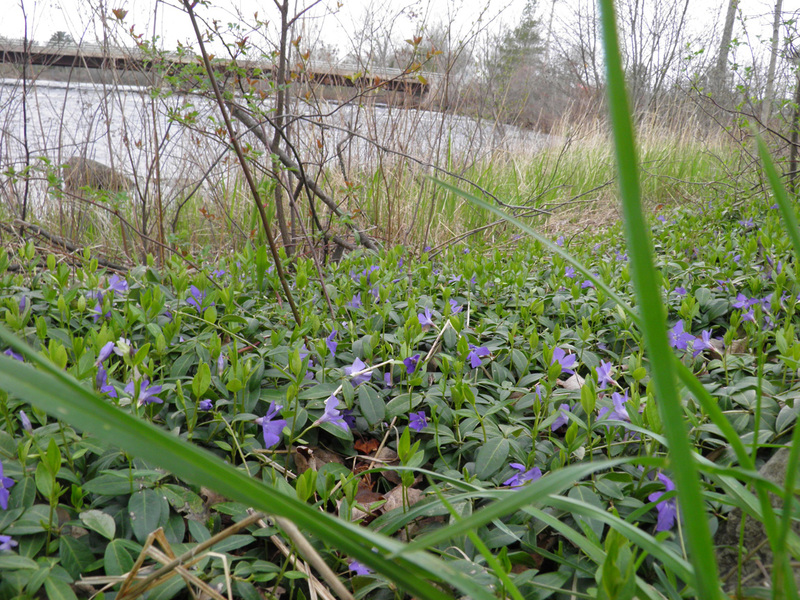 As far as Vinca's invasive nature goes, I have tried a few times to transplant some of this gorgeous little plant from the exact spot shown in these pictures. It’s died every time. I’ll be trying again this year. As the Romans would say: aeternum spe (forever hopeful). I still don’t know exactly what I’m doing wrong. It’s rampant in the place where I gathered it, and I only moved it about 1/2 km down the road… Maybe my soil isn’t rich enough, or perhaps a little too dry. Or maybe it just doesn’t like me… I hope it likes you. This is a beautiful useful plant. Just remember it may be difficult to control, so plant it in a spot where you can enjoy its spreading nature!